Below is our diagnostic tool, which you can use to help you diagnose your musucular problem. Simply click on the area where you are experiencing difficulties, and a list of potential problems and symptons will appear for that particular area. A pinched nerve is caused when a nerve is somehow damaged or injured by direct pressure or compression and is unable to properly conduct its signal. There are many potential causes for a pinched nerve, depending on the location of the nerve. One factor that may cause this is poor ergonomics. A stiff neck associated with muscle spasm, is often caused by sharp movements including whiplash or prolonged episodes of bad posture. Headaches where the pain originates in the cervical spine, neck and upper shoulders are often referred to as a cervicogenic headache. These headaches can be a symptom of whiplash, neck injury or muscle trauma due to poor prolonged posture or severe stress. Swimmer's Shoulder, or painful arc/rotator cuff tendonitis (or tendinopathy), is a repetitive stress injury where tendons in the shoulder have been damaged. The biomechanics of the freestyle stroke can cause inflammation of the shoulder tendons during both the pull through and recovery phases of the stroke. Is a syndrome which occurs when the tendons of the rotator cuff muscles inflamed as they pass through a space underneath the end of the collarbone and head of the humerus. This can result in pain, weakness and loss of movement at the shoulder. Shoulder instability is a problem that occurs when the structures that surround the shoulder joint do not work to maintain the ball within its socket. If the joint is too loose, is may slide partially out of place. If the joint comes completely out of place, this is called a shoulder dislocation. The rotator cuff is a group of four muscles (infraspinatus, supraspinatus, subscapularis, teres minor) which are responsible for coordinated movement and stability of the shoulder. Rotator cuff tears are of one or more of these four tendons and can include any type of irritation or damage to the rotator cuff muscles or tendons. These can be caused by sudden injury i.e. falling onto an outstretched arm or long-term degeneration. Wrist Sprain or Strain can usually occur when someone falls directly onto an outstretched hand or where the wrist is forced to bend beyond its full range of movement. A “sprain” usually involves the ligament whereas a “strain” usually refers to the muscle or tendon. Tennis elbow or lateral epicondylitis occurs when the tendon/muscle fibres that insert at the outer part of the elbow joint are torn or strained. 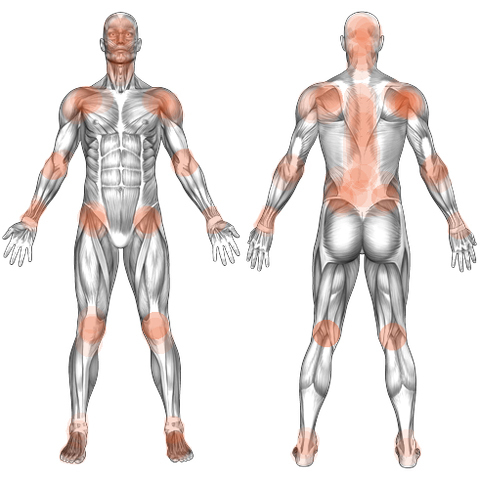 This can occur when there is a repetitive movement of the muscle or where a sudden increased force or burst of movement strains the soft tissues. There can also be damage to this area as a result of a direct hit to the area. FAI is a condition affecting the hip joint in young and middle-aged adults. Impingement occurs when the ball shaped femoral head rubs abnormally or doesn't have full range of motion in the acetabular socket. Damage in the hip joint can occur to the articular cartilage or the labral cartilage (soft tissue bumper of the socket). Treatment options vary from conservative treatment to arthroscopic and open surgery. Hip bursitis is a common problem that causes pain over the outer hip region. A bursa is a fluid filled sac that allows smooth motion between two surfaces. When the sac becomes inflamed, each time the tendon has to move over the bone, pain results. As patients with hip bursitis move this tendon with each step, hip bursitis symptoms can be quite painful. Tear of a meniscus is a rupturing of one or more of the fibrocartilage strips in the knee called menisci. Can be referred to as "torn cartilage" . Menisci can be torn during innocuous activities such as walking or squatting. They can also be torn by traumatic force encountered in sports or other forms of physical exertion. The traumatic action is most often a twisting movement at the knee while the leg is bent. In older adults, the meniscus can be damaged following prolonged 'wear and tear' called a degenerative tear. Pain in knee which worsens with going up or down stairs or when bent for a prolonged period. A high ankle sprain is an injury to the large ligaments (called the syndesmosis) above the ankle that join together the two long bones of the lower leg. High ankle sprains commonly occur from a sudden and forceful outward twisting of the foot, which commonly occurs in contact and cutting sports such as soccer, rugby union and rugby league. The ligament can also be an associated injury with more common low ankle sprains, and even ankle fractures. A high ankle sprain causes symptoms similar to other ankle sprains, but patients often complain of pain when the ankle is turned outwards or when the calf is squeezed. This refers to pain, weakness, numbness or tingling in the leg and is caused by injury or pressure on the sciatic nerve. Common causes are slipped disc, piriformis (a muscle in the buttock region) syndrome, pelvic fracture or injury, tumour.